We nearly didn't do another NOTE Olympics. Last year we weren't sure if people would get it but they did and it was hilarious. This year we weren't sure if it could live up to the worldwide hype the first one got. At the last minute we decided to go for it and piggy back the eS G.O.S. and see what happened. 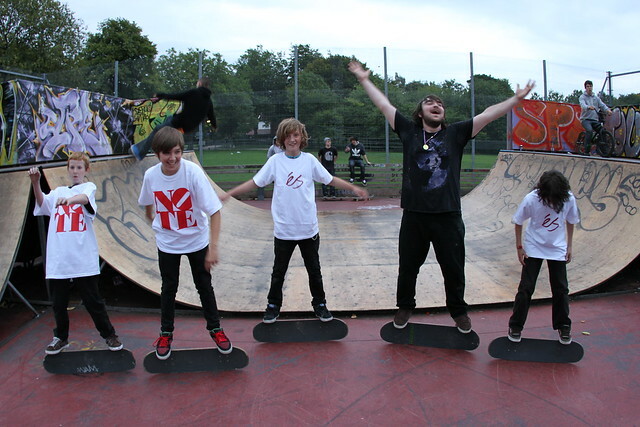 We kicked things off with hippy jump. A field of 20 odd athletes got whittled down to just Lloyd Mcleggon and Neil Worthington who had to jump it out like Wesley and Woody. Both of them cleared and beat Neil's record from last year so we had to balance beer cans on the high jump pole to try work out a winner. Despite clothing and an MP3 player being shed in a effort to lighten up they couldn't be separated and so it was joint gold. 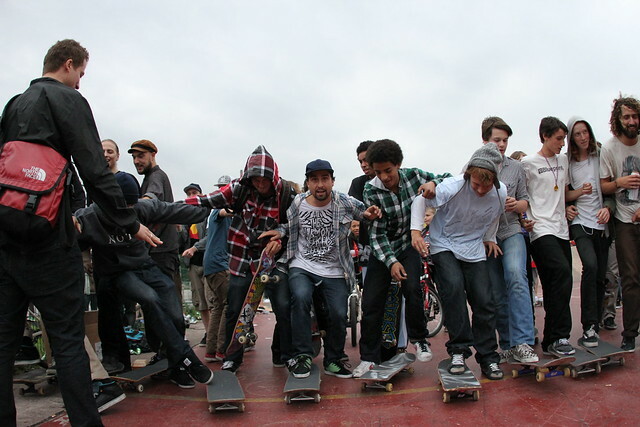 In the best trick over the hip the action was thick and fast as everyone hit up both sides of the pyramid at the same time in an effort to take home gold. 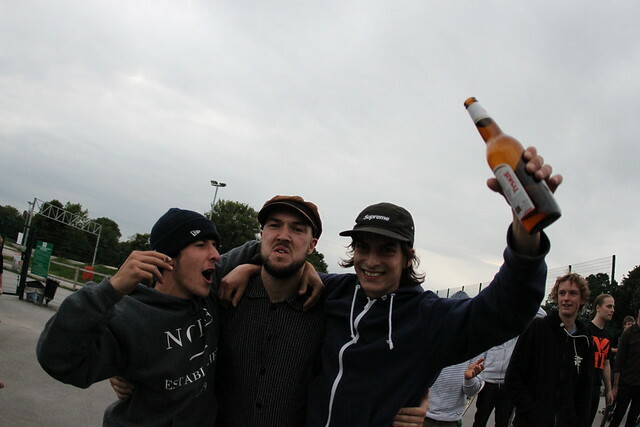 It was hard to take in everything that went down but Rowles did a half cab back foot flip, Hilly did a mean hardflip but Max Pouncey absolutely merked it with a back three flip, switch biggie heels and a double flip hards and took the gold back to the West Alty Massive. 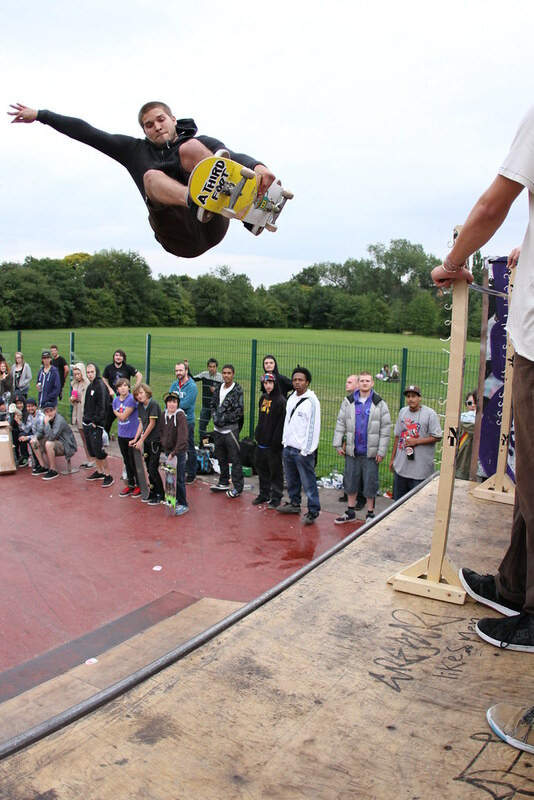 A new event for 2010 was the high air on the quarter. 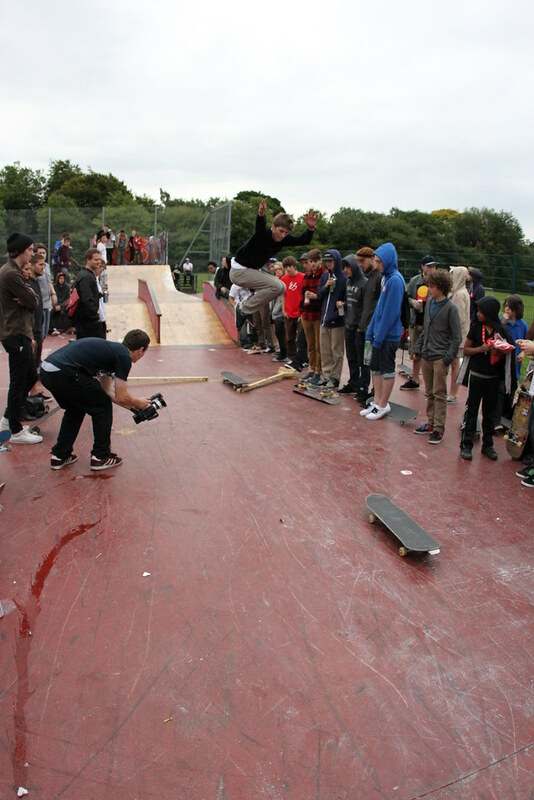 Nev's backside ollies and Ramp Champ Dave's frontside airs were both really high but Gary 'Woody' Woodward's aerial prowess at around the 5 foot mark meant he took the gold. The longest ollie is a nightmare to judge. We even tried dashing talc on the floor to help us see where people were landing. Some people thought Nev got furthest and others thought Ben Rowles did. In the end Ben got the gold and a tweaked ankle. The board to board jump (combat?) 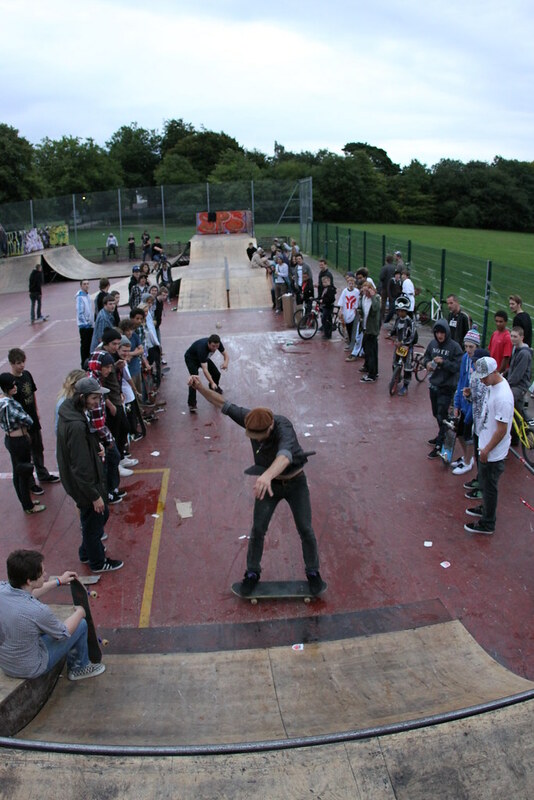 was a highly anticipated event and with hot favourites John Bell and Rogie both injured it was anyones for the taking. Neil went big but Jacob Johnson went massive and won himself a gold medal. Skate javelin is all about a balance of power and technique. It was clear that some people had put in more practice than others. Mark Kendrick overcame the disappointment of last years DQ and flung his skateboard like a frisbee for a new world record and more importantly gold. Everyone's favourite event the mongo 400m really separates the steeze from the stink. The track was crammed with racers trying to take the lead in to the first bend but it was Jim 'New Sensation' Sanders who powered through the pack from the back and took the win. Another new event for 2010 was the primo 100m dash. The New Sensation was on a roll and had the crowd behind him as he sprinted ahead of his young competition and bagged up his second gold on the trot. It was clear many people were getting a bit tired/inebriated by the time we got around to the contemporary handrail dance. There was no lack of attempts but not much actually got landed. 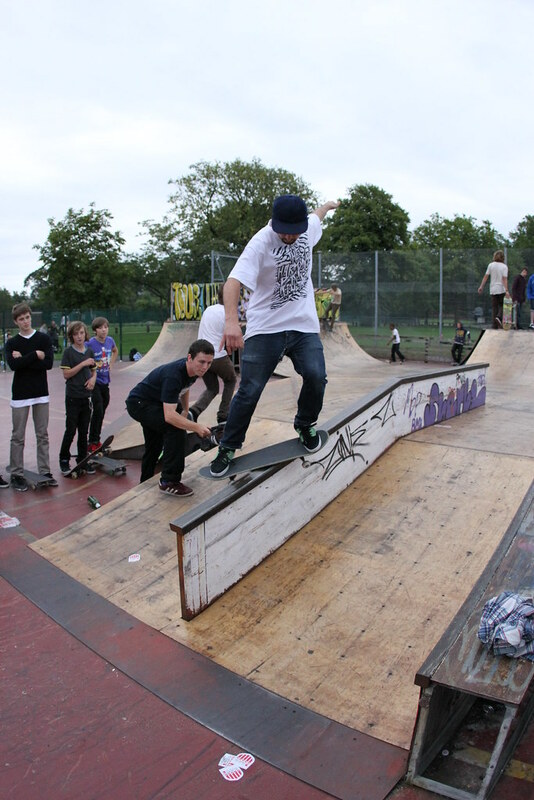 Paul 'Hilly' Hill pulled a flip back fifty and Tony got a switch feebs. 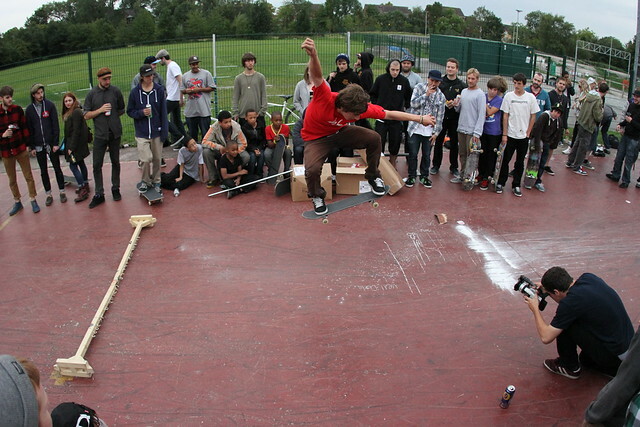 As the sun began to set we decided to squeeze in one more new event and inspired by talc and spilt booze we decided to make that a longest powerslide competition. This is without a doubt the most dangerous event we've had at the NOTE Olympics and hippers, swellbows and mild concussions were suffered as athletes slid at full speed. Neil managed to slide half way up the quarter and Kendo reached the quarter turned and started powersliding back. In the end we couldn't pick a winner from Neil and Kendo so they both got gold. So we'd done it and we're glad we did. Thank you to everyone who came along and I hope you all had a good time. 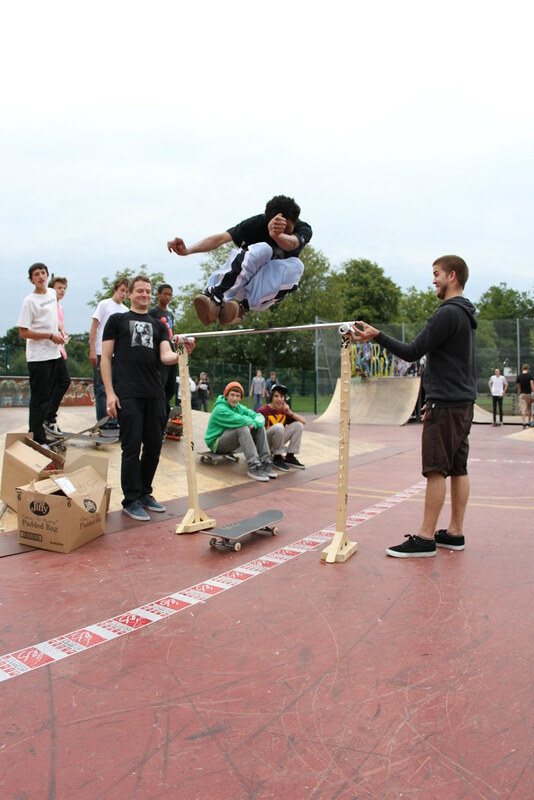 Thanks to eS, Etnies and Shiner Distribution for providing prizes. Lewis Abbot took all these photos and we're hoping to have an edit for you soon. Stay tuned.